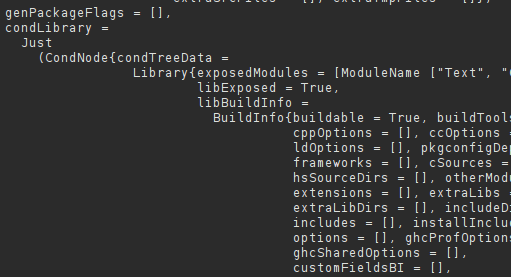 Tapping away at a complex datastructure, I find myself facing a veritable wall of Babel. 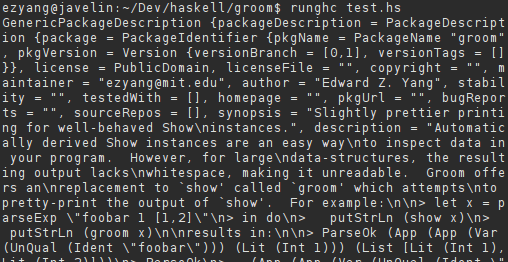 “Zounds!” I exclaim, “The GHC gods have cursed me once again with a derived Show instance with no whitespace!” I mutter discontently to myself, and begin pairing up parentheses and brackets, scanning the sheet of text for some discernible feature that may tell me of the data I am looking for. Update. Gleb writes in to mention ipprint which does essentially the same thing but also has a function for putStrLn . show and has some tweaked defaults including knowledge of your terminal size. Update 2. Don mentions to me the pretty-show package by Iavor S. Diatchki which also does similar functionality, and comes with an executable that lets you prettify output offline! Could you please fix the image links (they should point to http://blog.ezyang.com/img/groom/messy.png and http://blog.ezyang.com/img/groom/clean.png)? ipprint package does pretty much the same thing. They are broken here as well. Oh, that’s just AWESOME. Thank you!